Say the words “Private Transfer” and many people think it´s going to be really expensive. Well, quite often it´s not the case. You get a great personal service and reassurance that you are not paying over the top. We always use Shuttle Direct for our own personal private transfers and have no hesitation in recommending them to you. It´s nice landing somewhere, knowing you’re going to be met by someone who knows where you’re staying. It´s also relaxing knowing you’re not going to be ripped off the moment you land as it´s all paid for upfront. If you´re travelling with young children or toddlers and don´t want to bring car seats, then we recommend a private transfer as you can add them to your booking. Even though the law in Spain is the same as in the UK regarding child seats or restraints in private vehicles, Spanish taxis do not have to carry child seats. We highly recommend the use of car seats on the roads here in Spain. The other option is to hire a car and book a car seat. If you´re travelling alone and arriving late at night when the Public Transport no longer runs then we would highly recommend a Shared Transfer (depending where you’re staying). 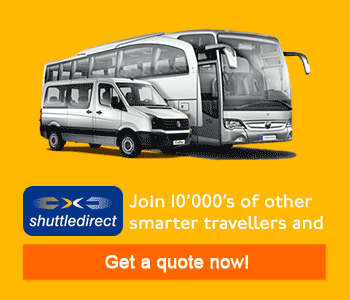 Just go to the “Book Now” above, add your destination, dates and select Shared/Shuttle Service Transfer. There will be a designated meeting point at Malaga Airport. Should you be going to a Private Residence, the Shuttle will take you to the nearest Hotel. 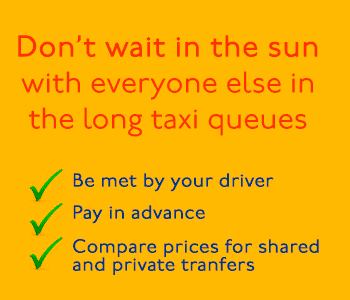 Remember shared transfers won’t be the quickest as they will be dropping other people off too. Please note this may not be available on every destination. The Trains only go as far as Alora or Fuengirola and stop before midnight. The Airport Buses go direct to Marbella, Estepona, Algeciras or La Linea and also stop before midnight, so depending on when your flight arrives, you may find that a shared transfer is a better and safer option. The taxi fare is a rough flat fee and covers up to 4 passengers. The private transfer costs quoted are per person based on 4 travelling, so times the number by 4. There will be extra charges for the time of day, day of the week, number of passengers, luggage / equipment. Taxis now have meters so it´s clear to see the price. Please note that there is a minimum fee from the airport around 15€. If you’re not going far, say to Malaga City, then you can take the Express A bus for 3€ or the train to Maria Zambrano. Taxis are situated on the right as you leave the arrivals hall. *There is now a bus from Malaga Airport to Nerja and also Marbella Estepona and Algeciras which might be a better option, certainly cheaper.